Many homeschoolers seek accreditation through an academy to provide themselves with some comfort in knowing their homeschool program is legitimate; but after homeschooling through an academy for seven years, we now homeschool on our own and I would like to share our story. My husband graduated from the public school system; but I graduated from homeschooling through an academy. We both knew that God’s Word called us to homeschooling; but my husband would only do so through an academy because he sought accreditation and wanted to be sure our homeschool was legitimate. Accreditation is a validation or statement by an accrediting agency that a school or department within a school has been thoroughly investigated and found worthy of approval. Accrediting agencies are organizations that establish operating standards for educational or professional institutions and programs, determine the extent to which the standards are met, and publicly announce their findings. But, you do not need to seek accreditation to homeschool. Our family homeschooled for seven years through an academy. The academy provided everything we needed, including achievement testing, lesson planner, textbooks, teacher manuals, course instructions, and maintenance of academic records. The academy provided a complete curriculum; but when we asked to use a different curriculum for science, the academy would not allow the curriculum for the grade level, even though the publisher stated the curriculum was for that grade level. Needless to say, we withdrew our students from the academy to homeschool on our own. We now have the freedom to choose our own curriculum! We now have the freedom to plan our school year – no more rigid work-submission schedules! Why pay thousands of dollars for administrative services when you can do this yourself? I have created a lesson planner that is also records grades and helps me keep up with my girls academic records. 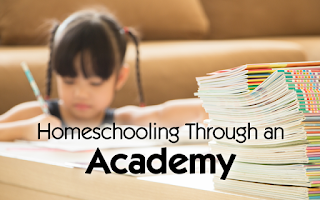 Homeschooling through an academy has many benefits; but homeschooling on your own has even more! God has called us to homeschool and He will equip us to do so! Trust in the LORD with all thine heart; and lean not unto thine own understanding. In all thy ways acknowledge him, and he shall direct thy paths (Proverbs 3:5-6).